SARASOTA – Odessa Crenshaw Butler was a teenager in the early 1950s who attended a segregated Booker High, watched movies in “colored only” movie theaters and was sometimes forced to order meals from the back doors of restaurants. “But we fought hard against it," said Butler, who was part of that push as the daughter of a well-known community civil rights activist. In Newtown the fight included a tireless crusade to end segregation at area beaches — starting long before the historic Brown v. Board of Education court ruling, and four years before Rosa Park's famous standoff on a transit bus in Montgomery in 1955. 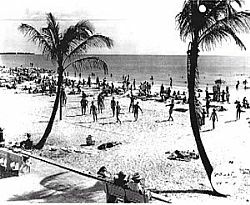 The beach segregation struggle included caravan demonstrations, in which groups of African-Americans from Newtown would meet and drive over to the city-owned Lido Beach for a day of surf and sun — whether they were welcome or not. Saturday, Butler and more than a dozen others, including some Newtown children, met at Payne Chapel for a commemorative motorcade to South Lido Beach.